44RPM - Half Model Kit, Half Skill Toy, and 100% Fun! 44RPM is a cool new skill toy company founded by professional yo-yo players Drew Tetz and Hank Freeman. They are creating a collection of lasercut toys exploring the idea of construction & creation as play. Half model kit, half skill toy, they transform from a flat wooden disc into elegant, functional reimaginings of classic toys! 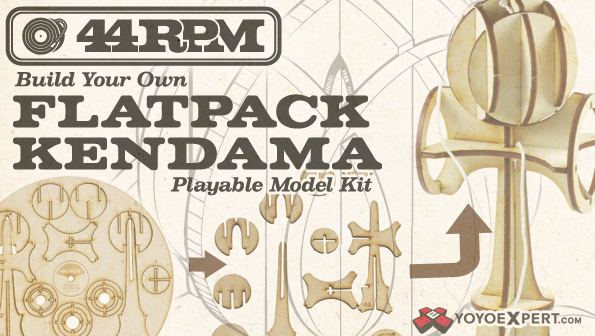 The 44RPM Flatpack Kendama combines the classic toy we all love with the fun of a buildable model kit. Just pop the pieces out & fit them together to build a beautiful & highly functional kendama, great for both expanding your collection & sharpening your skills! Made and designed in the USA, the Flatpack Kendama is lasercut from a single flat piece of 1/8" Birch wood and packed in a very cool hand-screened record sleeve. This Kendama has a really unique look when assembled, but it's still a kendama and it is designed to be played! It is worth noting, though, that the Flatpack Kendama construction naturally makes it lighter & more delicate than traditional kendamas. For this reason, we ask that you take care during assembly & while attempting risky tricks. Pennies not included with the Penny Pack. Glue not required for assembly, but if you plan to play this kendama often it will help with durability.